The Mirage Limestone Fireplace with Lights is a high quality fireplace which has been designed to be a transitional fireplace, which is the perfect blend between the traditional craftsmanship and contemporary modern design. This stunning fireplace package includes an arched fireplace in addition to a hearth which is curved to compliment the lines within the fire surround. To further enhance the visual aesthetics of this fireplace is the incorporation of two concealed halogen lights, which really brings the fireplace to life whether your fire or appliance is lit or not. 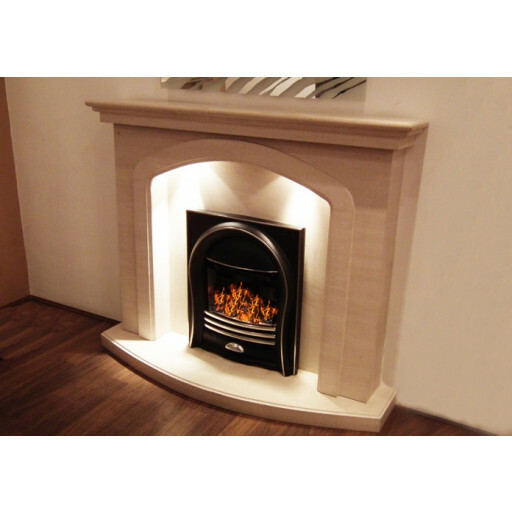 The Mirage Limestone Fireplace with Lights is a fantastic fireplace that will perfectly complement almost any home in which it is installed with the addition of a gas fire, electric fire or multi fuel appliance. The Mirage Limestone Fireplace with Lights is manufactured using only the highest quality craftsmanship and premium materials and will provide the perfect focal point of any room for years tom come. My elderly parents chose this to modernise their room. It looks fab, I might get the same one.